Freedom from defects such as stem punctures, stem end splitting, bitter pit, insect injury, decay, etc. Rapid cooling and cold storage temperatures can cause injury, including soft scald and soggy breakdown, and a conditioning period of a week at 20°C is usually recommended. 13 to 20 µl/kg·hr @ 20°C/68°F) The fruit does not show the typical autocatalytic ethylene production during maturation. Honeycrisp responds to a wide range of controlled atmospheres (CAs) from 1.5 to 3% CO2 and 1.5 to 4.5% O2 levels without much difference in firmness or acidity being detected. However, fruit can be sensitive to CA injury, including internal browning and cavitation resulting from high CO2. CA storage is common in some growing areas such as Nova Scotia and Washington, and less so in Ontario and the eastern U.S. Safe CA storage requires conditioning and then treatment with diphenyamine (DPA) or delays in air (e.g. 3°C for 4 weeks) before CA atmospheres are applied to reduce the risk of CO2 injury. Additional research may be needed to determine more optimal atmospheres and procedures within each growing region. Soggy Breakdown and Soft Scald. Soggy breakdown is an internal disorder characterized by soft, brown, spongy tissue that can form a complete ring within the fruit. Soft scald is characterized by brown ribbon-like lesions on the skin of the fruit that can extend into the flesh. Both of these disorders are associated with late harvest dates and storage of fruit at lower temperatures, close to 0°C, but it can occur at 3°C in late harvested fruit. Prestorage conditioning at 10°C for 5 to 7 days usually eliminates these disorders. Application of DPA has been shown to have minor effects on either disorder in this variety. Bitter Pit. Bitter pit is a calcium-related disorder that can occur on the tree or during storage and has been observed on Honeycrisp apples. Preharvest calcium sprays are most effective to reduce this disorder. Prestorage conditioning to reduce soft scald and soggy breakdown can exacerbate bitter pit symptoms. Tree pit (pits appearing on fruit still on the tree) is a predominant form of bitter pit in this variety in many growing regions and therefore postharvest calcium dips are not a good alternative to preharvest sprays. Senescent Breakdown. 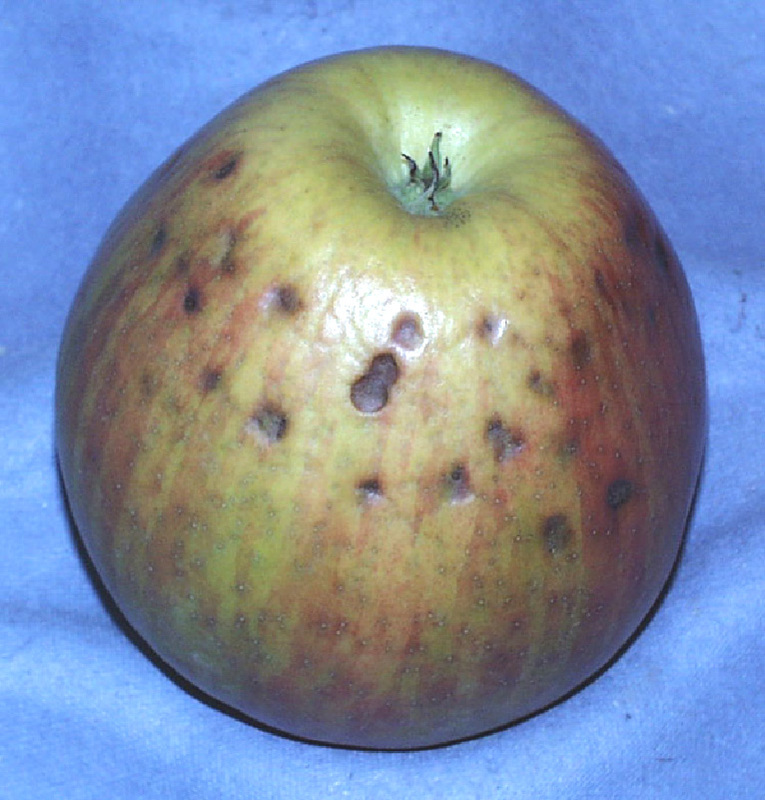 Senescent breakdown is a disorder characterized by the breakdown and browning of the flesh and can occur in late harvested fruit in this variety. Gray Mold, Blue Mold. These decay-causing pathogens can be controlled by avoiding fruit injury, sanitizing water systems with chlorine and cooling fruit quickly. 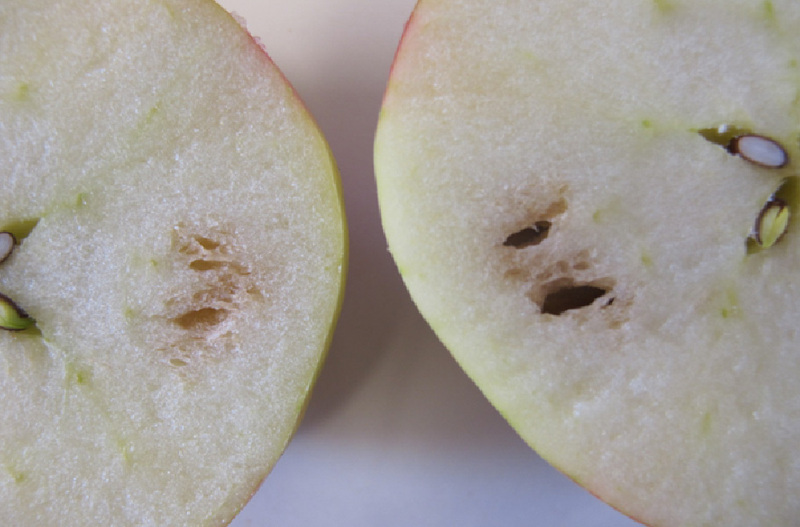 Honeycrisp apples are highly susceptible to punctures due to their thick rigid stems and sharply pointed buds. Wounds from this type of injury will ultimately become infected and cause decay during storage thus lowering pack-out percentages. Careful harvest practices, such as stem clipping, can reduce such injuries.